You may remember a few months back, Google mentioned that by showing giant, screen-covering ads for your app to mobile visitors it may lead to a ranking decrease. In April, Google expanded its algorithm to include mobile-friendliness as a ranking signal and starting 1 November, if sites have these type of large interstitials in place, they will no longer be considered as mobile friendly and therefore could receive a penalty. The reasoning is that while we want our ads to be as visible as possible to visitors, having the app install banner cover all the content on the page not only makes it impossible to see the content but it also makes it extremely hard to click on the little ‘x’ to close the banner. Possibly that was the whole idea behind full screen ads in the first place, because as a result it’s more likely that you’ll end up clicking on the ad accidentally, which will take you to Google Play to download and install the app. This is rightfully considered a bad user experience, which Google wants us to avoid. Google tested how interstitials on their own products affected users and found that while 9% of visitors did in fact go ahead and press the ‘get app’ button, 69% percent of users abandoned the page completely. These full page app install interstitials have certainly become an issue and Google has noticed. Most people who click on a search result are looking for a certain thing and chances are they want to see the content on the site and not a giant ad blocking all the content asking them to install its mobile app. That being said, it’s still ok to have app interstitials on your sites, they just need to be adjusted so that your sites are not hit with a potential penalty. If this is what happens when people visit your site via search, then you might be in for a bit of a surprise in regard to your site’s mobile rankings. This is how your site’s mobile app ad should be placed on the site. There’s nothing wrong with app install ads as long as they are done right and according to how Google wants them done. It’s also worth noting that this new algorithm change will not affect other types of interstitials, such as the app install banners that are supported by Safari (smart app banners) and Chrome (native app install banners). There is a way for you to check your site and which pages on your site are being affected by this new mobile update. The “Mobile Usability Report” in Search Console (formerly webmaster tools) will show you which pages across your site have an issue. Google has given site owners and webmasters lots of warnings about this, so we’ve had plenty of time to prepare for the new mobile algorithm change. Only time will tell if this will be enough to convince websites to move away from the full page app install banner ads and cooperate with Google. 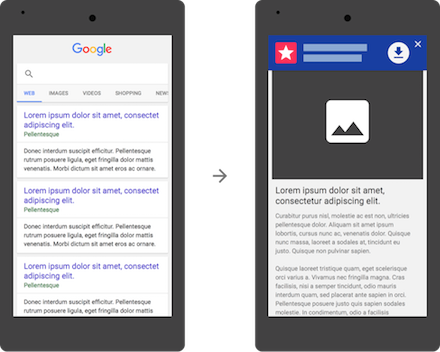 If you are unsure, keep in mind that right now sites that currently use full page app interstitials are already beginning to lose their “mobile-friendly” tags as well as the ranking boost that comes along with it. Is that enough to make you make the switch? Michael McManus, Earned Media Practice Lead at iProspect, also contributed to this article.